The K-Edge stem mount is designed for conventional handlebars so it lays the device flat making it mostly illegible from the Bacchetta cockpit. I added an inch of elevation so it can be tilted and it now faces me directly. I used the thick reduction spacer that comes with the Garmin OutFront bracket and some tiny M3 bolts. I found the M3 bolts at a hobby shop. K-Edge mounting systems are made right here in Boise, Idaho! I use the same mount but rotate it 180 degrees so that the flexible portion pivots behind the stem. That way I can face the Garmin almost vertically toward me. My handlebar setup (tiller) allows this but there are so many times that I need to adjust the Garmin to avoid bright sunlight or to enhance the background in order to see it. It's like a `floating' Garmin. 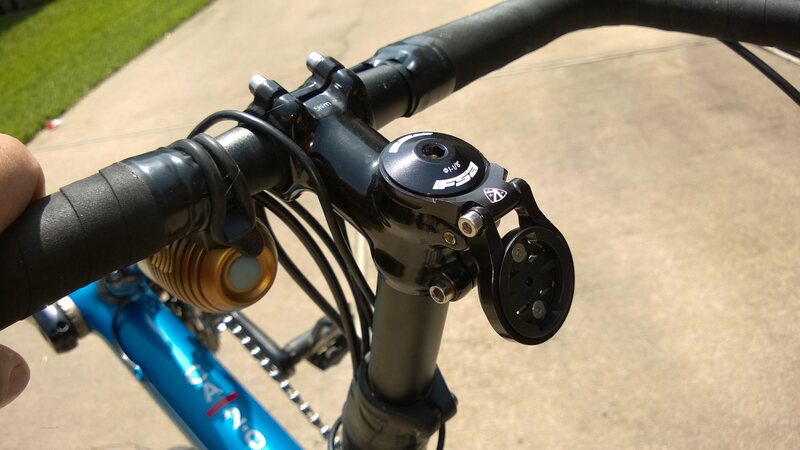 Did you need to modify the K-Edge Garmin mount, or was it as simple as rotating 180 degrees? I made no modifications to the unit I received. Just slightly loosen the Garmin mount from the stem ring and see how much you can flex it. But it should have plenty of range of motion. I followed your lead and have already ordered, received and installed the K-edge mount in your manner. Voila! Perfect solution! Yeah, I couldn’t simply use the k-edge out of the box. The combination of stem and riser on my Giro26 put the Garmin right where my knee would hit it. So,after a few scrapes,and bruises, I decided to move the thing. But the position required the modification I suggested.